The 2018 SATU Presidents' Forum was held on November 16 and 17 at National Cheng Kung University in Tainan. SATU stands for “Southeast and South Asia and Taiwan Universities”. This organization has a permanent international secretariat set up in National Cheng Kung University, which organizes a SATU Presidents' Forum every two years. Dr. Yao Leether, the political deputy Minister of Education, gave the opening remarks. 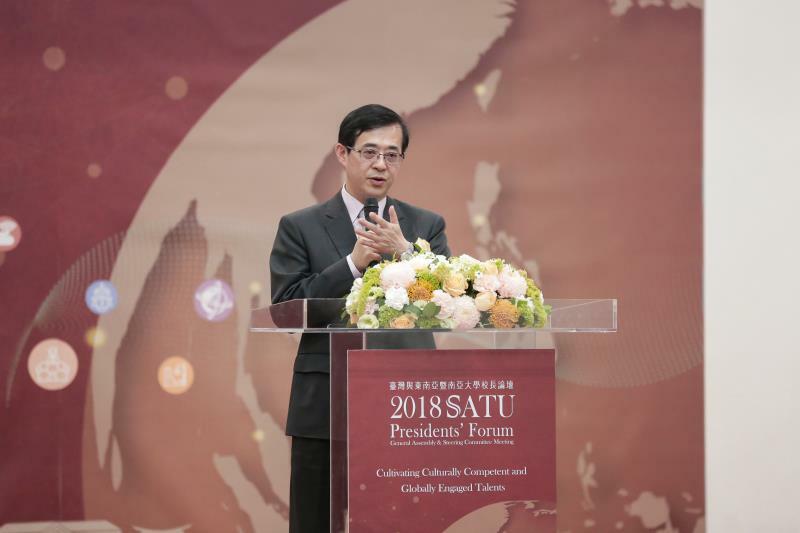 He pointed out that the SATU Presidents' Forum has provided a platform for communication between higher education leaders in Southeast Asia, South Asia, and Taiwan since 2003. It provides an opportunity for particating universities to engage in discussions and explore possibilities for expanding cooperation. He mentioned that in order to increase mutual understanding, Taiwan is progressively setting up courses on the languages and cultures of Southeast Asia, and providing more scholarship assistance programs for our students to study and do internships in Southeast Asia and South Asia. At the same time, Taiwan welcomes students and researchers from Southeast Asia and South Asia to come here, and we provide a wide range of assistance grants under the New Southbound Talent Development Program. The 2018 SATU Presidents' Forum focused on the training of highly skilled people who are “culturally competent” and “globally engaged”, including industry and academia collaboration. Parallel sessions on agriculture, engineering, and medicine gave attendees opportunities for further discussion highly relevant to their own university.